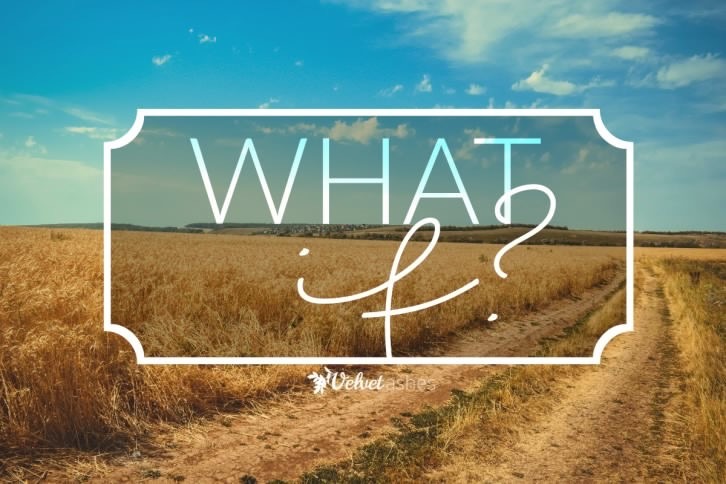 If kingdoms were based on questions, I would be the queen of “What if…” Anyone that has known me for very long will have heard this question pop up more than once in some form or fashion, and my family could probably fill pages with stories of my worries. It started way back when I was a little girl. What if robbers break into our house at night? I bugged my parents over and over to make sure the doors were securely locked. What if things are not done fairly? I think cutting pieces of pizza into 1/8ths is a little extreme on the scale of equality, don’t you? What if I don’t get the Barbie I want for Christmas? Some fears were more serious than others. I’m not sure I ever stopped looking for things to worry about. What if I don’t get high enough grades in college? What if I can’t figure out what to do with my life after I graduate…or ever? What if something happens to my family members? You are probably getting the idea that I tend toward the anxious, the pessimistic. I’m a glass-half-empty kind of person. My what-if questions are not usually happy. I’m realizing that, as I look at my hopes and the thoughts that flit through my mind daily, my expectations need a pretty big turnaround. Be brave. Be strong. Don’t give up. Expect God. Expecting God certainly turns my normal what if questions on their head. What if God shows up in a big way? What if God answers the prayer we pray over a sick person? What if He shows us He is still at work in a little way? I was struck with that fact that I don’t often expect God. I think of the worst-case scenario, dread what is coming, worry my little heart out. But where is my faith to believe that God will step in? To believe that He is already at work? Fears are often legitimate and bad things do happen. But when I put my energy into thinking about those things, rather than resting in the power of a God who created all the beauty I see around me and knit me together in my mother’s womb, I spend hours filled with anxiety when I could be filled with many other good things. I know that I won’t be able to turn off the what-if questions, just like that, but I need to start finishing them in a different way, a way filled with expectancy for what God can and will do. What would happen if I expected God? I’ve always been a rather optimistic glass half full person – and yet I was a “worry-wart” (my mother’s words) growing up. Somehow with all my optimism I still managed to worry about everything. I think the key is in your last words, even to keep asking the “what if’s” but “to finish them in a different way, a way filled with expectancy for what God can and will do”. That fits so well with what Amy said at the Grove today – moving from the Orphan realm to the Freedom Realm. Sarah, I love how you share yourself . . . and then God’s hope for you/us :)! This is beautiful, thanks for linking!